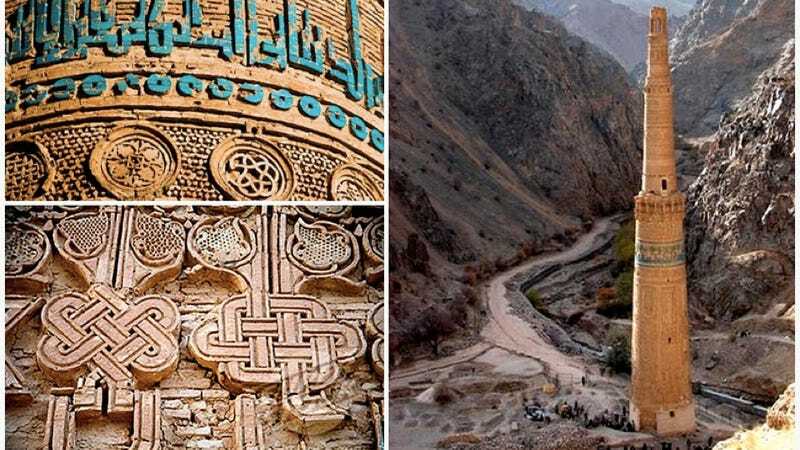 One of the great wonders of the medieval world is a very tall, heavily ornamented minaret nestled in a green valley at the edge of the Jam river in what is now Afghanistan. Often called the Minaret of Jam, the monument was almost a millenium ago illuminated by a torch at its top, and surrounded by a thriving town with small industries and outlying farms. What's remarkable is that the writing on the minaret and archaeological remains nearby strongly suggest that the city harbored a population of Muslims, Christians and Jews. Writing on the minaret is a detailed transcription from the Koran that celebrates the life of Mary, mother of Jesus, highlighting the connections between Islam and other religions. Nearby there is a Jewish graveyard, which is another hint that people of different religions were living peacefully together. Was this lost city once a bastion of medieval tolerance? Some archaeologists believe the region around the Minaret of Jam was once called Firuzkuh and was the summer capitol of the Ghurids (سلسله غوریان), a Muslim empire in the 11th and 12th centuries, that spanned all of what we know now as Afghanistan as well as parts of eastern Iran and northern India. This map shows its location. Today, it is a very remote outpost in Afghanistan's Ghor province, surrounded by a few farms and little else. It is almost impossible for outsiders to get to the area, though it was declared a world heritage site, and preservation groups are working to prevent the tower from falling over (earthquakes in the area have caused it to lean). Several years ago, UK architecture critic Dan Cruikshank described his difficult journey past police and insurgents to reach the minaret and film it for a BBC special. The minaret is made of hard yellow brick. As I stood before it, I saw that it is in this material that the building's most striking message is written. Its shaft is a dazzling display of virtuoso brickwork, with geometric forms incorporating Islamic eight-pointed stars and Kufic lettering. There is a panel bearing the date of construction: 1193/4. But, more importantly, the lower portion bears the entire 19th sura of the Koran. This chapter, called Maryam, tells of the Virgin Mary and Jesus, both venerated in Islam, and of prophets such as Abraham and Isaac. It's a text that emphasises what Judaism, Christianity and Islam have in common, rather than their differences. It seems the Ghorids placed the text here to appeal for harmony and tolerance in the land, a message that is more relevant now than ever. Inside, I found a stupendous, engineered construction, with two spiral staircases winding around each other to form a double helix. This strong construction, combined with the fine brickwork, has preserved the structure from earthquakes and neglect. The minaret is the second largest of its kind in the world. It still stands today, a monument to humans' constant struggle to live in peace together, against all odds.